A taquito (Spanish pronunciation: [taˈkito], lit. Spanish for "small taco"), tacos dorados, rolled taco, or flauta (Spanish pronunciation: [ˈflauta], lit. 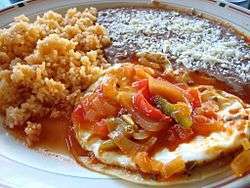 Spanish for "flute") is a Mexican food dish most often consisting of a small rolled-up tortilla and some type of filling, including beef, cheese or chicken. The filled tortilla is crisp-fried. The dish is often topped with condiments such as sour cream and guacamole. Corn tortillas are generally used to make taquitos; the dish is more commonly known as flautas when they are larger than their taquito counterparts, and can be made with either flour or corn tortillas although using corn is more traditional. In some areas, such as New Mexico, taquito refers not to the rolled-up tortilla dish, but rather a smaller version of the taco. The taquito or small taco was referred to in the 1917 Preliminary Glossary of New Mexico Spanish, with the word noted as a "Mexicanism" used in New Mexico. 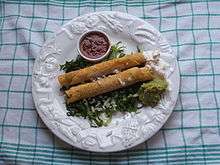 The modern definition of a taquito as a rolled-tortilla dish was given in 1929 in a book of stories of Mexican people in the United States aimed at a youth audience, where the dish was noted as a particularly popular offering of railroad station vendors. Taquitos were referred to, without definition, in a 1932 issue of the Los Angeles School Journal. Two Southern California restaurants are often given credit for their roles in the early development of the taquito. Cielito Lindo was founded by Aurora Guerrero in 1934 and located on Olvera Street in Los Angeles. Guerrero's daughter used her taquito recipe in opening chain restaurants in Los Angeles, and soon competitors were selling similar dishes. In San Diego, what would become El Indio Mexican Restaurant began selling taquitos during World War II, when tortilla factory owner Ralph Pesqueria, Sr., was asked by workers at the Consolidated Aircraft Company factory across the street for a portable lunch item. Pesqueria, who used a recipe developed by his Mexican grandmother, has claimed credit for introducing the word "taquito" for the dish. Taquitos were among the early Mexican food items developed as a frozen food, with Van de Kamp's introducing a successful frozen taquito offering by 1976. The United States government has determined that taquitos must contain at least 15% meat. Crispy fried taquitos sold in Mexico are often called tacos dorados ("golden tacos") or flautas. Typical toppings and sides include cabbage, crema (Mexican sour cream), guacamole, green chili or red chili salsa and crumbled Mexican cheese such as queso fresco. "Taquitos" in the Mexican border cities of Tijuana and Mexicali refer to small tacos sold in stands, rather than the rolled taco dish. ↑ Barcia, Roque (1883). Primer diccionario general etimologico de la lengua espanola, Volume 5, Part 1. Madrid: Establicimiento Tipográfico de Álvarez Hermanos. p. 30. 1 2 "Wrap It Up - A Guide to Mexican Street Food". Mexico Connect. Retrieved 2008-06-28. ↑ Arellano, Gustavo. Taco USA: How Mexican Food Conquered America. Simon and Schuster. 2012. p.153. 1 2 Robert Norris McLean & Mabel Little Crawford (1929). Jumping beans: stories and studies about Mexicans in the United States for junior boys and girls. Friendship Press. p. 144. Retrieved 18 April 2012. 1 2 Castro, Rafaela. Chicano folklore: a guide to the folktales, traditions, rituals and religious practices of Mexican Americans. Oxford University Press, 2000. p.217. ↑ Lee, Cecelia Hae-Jin. Quick & Easy Mexican Cooking: More Than 80 Everyday Recipes 2011. p.107. ↑ Kercheville, F.M., A Preliminary Glossary of New Mexico Spanish. from Bulletin of the University of New Mexico, Whole No. 88, Language Series, Sept 1917, Vol. 1 no. 3. p.56. ↑ Los Angeles School Journal. Volume 16, Issues 1-18. 1932. "On a plate before us is a "taquito" on shredded lettuce. On the table is a generous dish of well-cooked "frijoles", and there are plates piled high with "tortillas de maiz", the National bread." 1 2 Arellano, Gustavo (2012). Taco USA: How Mexican Food Conquered America. New York, NY (USA): Scribner. pp. 53 and 57–58. ISBN 978-1-4391-4861-7. Retrieved 7 July 2012. ↑ Fieri, Guy and Ann Volkwein. Diners, Drive-ins and Dives p.182. ↑ Bedford, Ed. Lunch with the Gods. San Diego Reader. March 1, 2007. ↑ Bates, Colleen Dunn, Susan LaTempa, and Menasha Ridge. The Unofficial Guide to California with Kids. 2010. p.53. ↑ Quick Frozen Foods. Volume 38. 1976. ↑ Uniform laws and regulations: in the areas of legal metrology and motor fuel quality as adopted by the 80th National Conference on Weights and Measures, 1995. Joan A. Koenig, National Conference on Weights and Measures, United States. National Bureau of Standards, National Institute of Standards and Technology, U.S. Dept. of Commerce. 1996. p.182. ↑ Ridgely, Roberta. The Tijuana, Mexicali, Ensenada Guide. J. P. Tarcher. 1975. p.155. "The Piggyback Taquito Stands of Mexicali A number of impromptu stands selling small tacos (taquitos) snuggle up to excellent established restaurants from which they have borrowed their names."